Thanks to Trinity College London, the sponsoring organisation for this show, I was offered two free tickets in exchange for a review. The show wasn’t on my original “must see” list, but the Fringe is all about the unexpected! 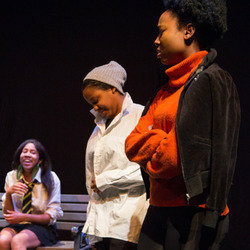 A Concrete Jungle Full of Wild Cars won the 2012 Trinity International Playwriting Competition in the category “a play for teenage audiences”. Written by an author of Sierra Leonian origins, the play follows the arrival of three teenagers who have been sent from Sierra Leone to London in the mid 1990s to keep them safe from the civil war. The most outstanding aspect of this play was the use of language. Characters spoke in both Sierra Leonian creole and in English with a wide range of accents. This rich linguistic variety helped to transport the audience right into the cultural melting pot of London and highlighted key information about the characters quickly, which is vital in a short play (this one runs to 50 minutes). Music was also used to great effect, with a simple folk tune used throughout the story to bring the two worlds of Britain and Sierra Leone together. In terms of plot, this show is clearly aimed at a teenage audience. The supernatural element of the charm bracelet which Zina is given lifts a story that might otherwise be very dark, and makes it more accessible for teenage audiences. Although the play touches on issues around immigration, child soldiers, and even peer pressure and teenage drinking, it never feels like an “issues” play – it’s just a good story about characters you care about, told really well. Although the cast were largely young, I was exceedingly impressed with the standard of acting. I absolutely loved Elizabeth Alabi as the creole-speaking Gran – a vibrant performance. Sophia Thomas also performed wonderfully as Zina, capturing the conflicted emotions of a young migrant with sensitivity. There,were some weaker performances, Simone Thomas’ Aunty was a little too tentative, and Lula Mebrahtu as Kosey lacked some of the subtlety of the actors playing his sisters. Overall, however, the cast certainly lived up to the excellent script. The accapella singing was excellent, and there was some brilliant West African dancing too. All in all, impressive performances, and much better than many others I’ve seen at the Fringe over the years. The script was excellent, and the cast lived up to its demands without difficulty. I enjoyed the simple but effective plot, and went away humming the catchy African melodies sung by the cast. I do, however, wonder if this show did not attract large audiences (and better reviews) because it is, ultimately, a play for 12 to 16s. There isn’t the depth and complexity in the script that the subject matter demands for this to really challenge and engage what is, at the Fringe, a largely adult audience. However, I hope that the cast continues to enjoy performing and that this play is picked up by schools and youth theatres in the future, as it certainly deserves to have a long life. This entry was posted in Reviews, Theatre and tagged 4 stars, fringe 2013, reviews, theatre on 8th August 2013 by .